"In several of his analyses, Talcott Parsons describes the establishment of modern societies as a differentiation process across spheres of mutual recognition. In this paper, I use Parsons’ social theory of recognition to examine features of recent social conflicts. I begin with Parsons’ description of the struggles for recognition that took place during his lifetime in the highly industrialized societies of the west (1). I then use Parsons’ view of normatively ordered recognition conflicts to point out societal trends that led, in the final third of the twentieth century, to a gradual undermining of the pacification structures postulated by Parsons (2). An initial outcome of this apparent disintegration I describe as a “barbarization” of social conflict. By this I mean a state of society where struggles for social recognition escalate and become anomic because resolution can no longer be found in the existing systemic spheres of negotiation (3). This paper shows the importance of the term recognition to social theory by following Parsons’ theory in analyzing structural transformations that are currently emerging in response to social conflict." Axel Honneth is Professor of Social Philosophy at Goethe University and Director of the Institute for Social Research in Frankfurt am Main. Later this year, Honneth will join the Philosophy Department at Columbia University. 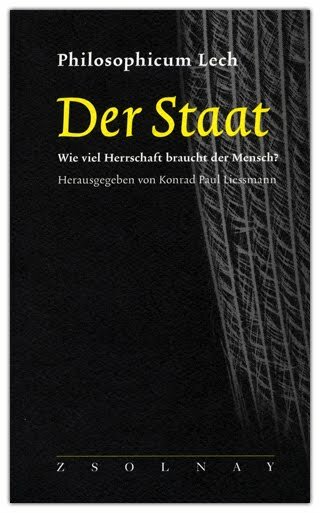 A new book by Honneth, entitled "Das Recht der Freiheit: Grundriß einer demokratischen Sittlichkeit", is coming out this summer on Suhrkamp Verlag. 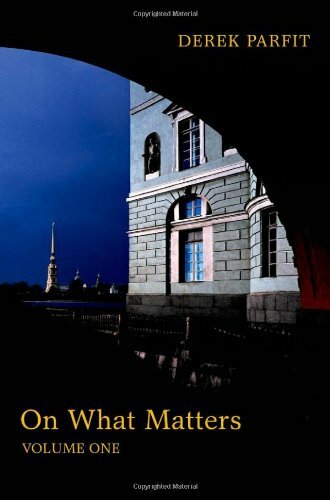 On What Matters is a major work in moral philosophy. It is the long-awaited follow-up to Derek Parfit's 1984 book Reasons and Persons, one of the landmarks of twentieth-century philosophy. Parfit now presents a powerful new treatment of reasons, rationality, and normativity, and a critical examination of three systematic moral theories - Kant's ethics, contractualism, and consequentialism - leading to his own ground-breaking synthetic conclusion. Along the way he discusses a wide range of moral issues, such as the significance of consent, treating people as a means rather than an end, and free will and responsibility. Parfit's book is dedicated to Thomas Nagel and T. M. Scanlon. - What If Everyone Did That? Various draft manuscripts of the book have been available online. See an early draft, entitled "Climbing the Mountain", here (pdf, 310 pages), and a draft from December 2008 here (pdf, 750 pages). Five chapters in Part II and Part III are adapted from Parfit's Tanner Lectures in 2002: "What We Could Rationally Will" (pdf). See Ratio's special issue on Parfit's "On What Matters" here. See a reading group of the draft manuscript "Climbing The Mountain" here. See a bibliography of Derek Parfit's publications here. Derek Parfit is Emeritus Fellow at All Souls College, University of Oxford. "Habermas's Discourse Theory of Law"
This chapter provides an introductory overview of Jürgen Habermas’s discourse theory of law. A survey of his main theses concerning law is organized according to three broad perspectives: 1) history and sociology of law, 2) philosophy of law, and 3) theory of legal adjudication. The paper is published in Barbara Fultner (ed.) - Jürgen Habermas: Key Concepts (Acumen Press, 2011). See my post on the book here. Also see Christopher Zurn's new paper on "Judicial Review, Constitutional Juries and Civic Constitutional Fora: Rights, Democracy and Law". Conference on "Overcoming the Trap of Resentment"
Misunderstanding Cultures: Islam and "the West"
"The Global Reach of Human Rights"
Workshop on "Rawls and Property Owning Democracy"
"Rawls and Property Owning Democracy"
Speakers: Stuart White (Oxford),Thom Brooks (Newcastle), Annabelle Lever (Geneva), Martin O'Neill (York), Alan Thomas (Tilburg), Thad Williamson (Virginia). Respondents: Daniel Augenstein, Sean Gould, Bert van de Ven, John Van Houdt (all Tilburg). 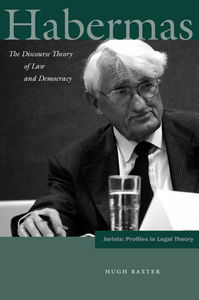 Though many legal theorists are familiar with Jürgen Habermas's work addressing core legal concerns, they are not necessarily familiar with his earlier writings in philosophy and social theory. Because Habermas's later work on law invokes, without significant explanation, the whole battery of concepts developed in earlier phases of his career, even otherwise sympathetically inclined legal theorists face significant obstacles in evaluating his insights. A similar difficulty faces those outside the legal academy who are familiar with Habermas's earlier work. While they readily comprehend Habermas's basic social-theoretical concepts, without special legal training they have difficulty reliably assessing his recent engagement with contemporary legal thought. This new work bridges the gap between legal experts and those without special legal training, critically assessing the attempt of an unquestionably preeminent philosopher and social theorist to engage the world of law. Hugh Baxter is Professor of Law and Philosophy at Boston University. Review of "Jürgen Habermas: Key Concepts"
"Anyone who has read Habermas knows how daunting his writing can be. Aside from the notorious density and abstractness of his prose, there is the challenge posed by the sheer scope of his undertaking. Quite simply, he stands out among our great contemporary thinkers for having dared to write a system of philosophy that crosses both disciplinary and thematic boundaries. In addition to this challenge, his thought has undergone several major permutations and countless minor ones over the past half century, as evidenced by the thirty some odd books and collections he has authored. So we are truly fortunate that Acumen chose to include a book on Habermas in its exceptional Key Concepts series. These volumes are designed to provide synoptic introductions to important thinkers. This volume, edited by the well-known Habermas translator and scholar, Barbara Fultner, is a fine addition to the series. The essays included in this volume are written by eminent specialists in their respective fields, many of whom studied with Habermas. They are uniformly of high quality, and most are written at a level that upper-division undergraduates should find accessible. Furthermore, although most of them present a sympathetic case for Habermas's ambitious undertaking, they do not shy away from noting potential weaknesses. In short, this is about as complete an account of Habermas's social philosophy as one might possibly expect from a modestly sized volume. (....) this volume will likely remain a standard source for students of Habermas, who will appreciate its overall evenhandedness and comprehensiveness." David Ingram is Professor of Philosophy at Loyola University Chicago. He is the author of "Habermas and the Dialectic of Reason" (Yale University Press, 1989) and "Habermas - Introduction and Analysis" (Cornell University Press, 2010). Thanks to Ali Rizvi for the pointer. "Peace, Violence, and Development in Modern Society"
Interviews with Judith Butler, Seyla Benhabib, Michael Sandel, Axel Honneth et.al. 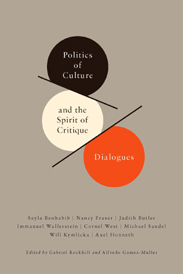 A French edition of the interviews came out last year, entitled "Critique et subversion dans la pensee contemporaine americaine: Dialogues" (Editions du Felin, 2010). Gabriel Rockhill is Assistant Professor of Philosophy at Villanova University. Alfredo Gomez-Muller is Professor of Latin American studies at the Francois-Rabelais University,Tours. Under what conditions are people responsible for their choices and the outcomes of those choices? How could such conditions be fostered by liberal societies? Should what people are due as a matter of justice depend on what they are responsible for? For example, how far should healthcare provision depend on patients' past choices? What values would be realized and which hampered by making justice sensitive to responsibility? Would it give people what they deserve? Would it advance or hinder equality? The explosion of philosophical interest in such questions has been fuelled by increased focus on individual responsibility in political debates. Political philosophers, especially egalitarians, have responded to such developments by attempting to map out the proper place for responsibility in theories of justice. 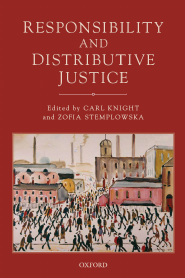 Responsibility and Distributive Justice both reflects on these recent developments in normative political theory and moves the debate forwards. Written by established experts in the field and emerging scholars, it contains essays previously unpublished in academic books or journals. Carl Knight is Research Fellow at the University of Glasgow. Zofia Stemplowska is Lecturer at the University of Warwick. Robert Pippin is Professor of Philosophy at the University of Chicago. His latest book is "Hegel on Self-Consciousness: Desire and Death in the Phenomenology of Spirit" (Princeton University Press, 2011). See the introduction here [pdf]. Robert Pippin was awarded the Schiller Professorship in Jena, Germany, for 2011. "Aspects of Reason: Justification and Explanation"
The conference aims to explore the role of justification and explanation as central aspects of rationality. These topics will be discussed in terms of selected issues in theoretical and practical philosophy. The first part of the conference (Friday, June 3) focusses on questions concerning ultimate justification in theoretical philosophy (talks by Della Rocca, Houlgate, Stange a.o.). The second part (Saturday, June 4) is dealing with the role of explanation and justification with regard to agency and practical norms (talks by Brandom, Bittner, Dancy a.o.). "Knowing and Representing: A Reading of Hegel’s Introduction to the Phenomenology". May 30: "Conceptual Realism and the Semantic Possibility of Knowledge". May 31 "Representation and the Experience of Error". June 1: "Determining Meaning and Truth: The Emergence of the New, True Object". In this series of Hegel lectures, Brandom is going to present new texts on the "Introduction" of Hegel's Phenomenology for the first time. See Brandom's handouts and lecture notes from his seminar on Hegel's Phenomenology. Robert Brandom is a Distinguished Professor of Philosophy at the University of Pittsburgh. He is the author of "Making It Explicit" (Harvard University Press, 1994), "Articulating Reasons" (Harvard University Press, 2000) and "Reason in Philosophy" (Harvard University Press, 2009). Later this year he will publish a new book on Harvard University Press, entitled "Perspectives on Pragmatism: Classical, Recent, and Contemporary". See my previous posts on Robert Brandom here and here. Neues Buch: Wie viel Herrschaft braucht der Mench? Wie viel Herrschaft braucht der Mench? Der Staat. Wie viel Herrschaft braucht der Mensch? Wie viel Mensch braucht der Staat? Der Triumph des Liberalismus. Ein Nachruf. The book is based on papers presented at a conference in Leh am Arlberg, Austria, September 22-26, 2010. Hear Professor Konrad Paul Liessmann's introduction to the conference here [podcast]. Interview with Habermas - "Europa und die neue Deutsche Frage"
"Europa und die neue Deutsche Frage"
The interview took place on April 6, 2011, in Berlin at a meeting on "Europe and the re-discovery of the German nation-state", arranged by the Berlin office of the European Council on Foreign Relations (ECFR). See my post on the meeting and Habermas's speech - "Ein Pakt für oder gegen Europa?" - here. "Bekommen wir eine Wiederauflage jener „Deutschen Frage“, die überhaupt erst zur Gründung der Europäischen Union geführt hat? Ich glaube nicht. Seinerzeit hatten die Politiker den Zweiten Weltkrieg und die Massenverbrechen im Rücken und Kategorien des 19. Jahrhunderts im Kopf. Damals war die Absicht, eine erneute Machtpolitik eines Kolosses in der Mitte Europas durch Einbindung zu verhindern, ein wichtiges Motiv. Eine ähnliche Situation sehe ich heute nicht. Mir scheint die Bundesrepublik, die wir seit einigen Jahren in zunehmender Konturlosigkeit vor Augen haben, eher dadurch charakterisiert zu sein, dass sie keine im klassischen Sinne machtpolitischen Interessen verfolgt. Die Regierungen dieser wirtschaftlich erfolgreichen Republik machen sich abhängig von den beiden Imperativen, denen heute jeder Staat mehr oder weniger folgen muss, nämlich die Ökonomie innerhalb der Grenzen gewisser sozialer Rücksichtnahmen so auf Wettbewerbsfähigkeit zu trimmen, dass die Output-Legitimation Schwierigkeiten verhindert, die man innenpolitisch bei der Wiederwahl fürchtet. Insofern handelt es sich, was den politischen Gestaltungswillen angeht, eher um eine schwache Bundesrepublik. Aber mit dieser Schwäche geht eine wachsende nationale Selbstzentrierung einher; und damit entsteht heute in der Mitte Europas ein Störpotential, das unter der jetzigen Regierung die Einigung Europas zum ersten Mal ernstlich blockiert." Podcast from "Deutschlandsradio Kultur" [mp3], May 4, 2011.